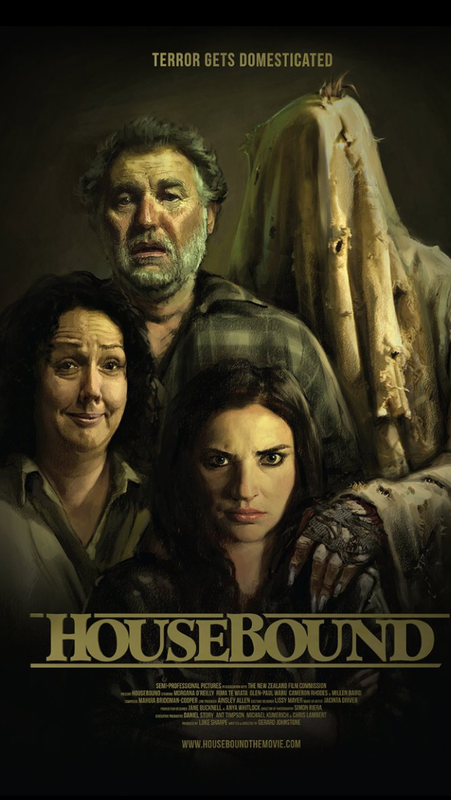 Housebound is a New Zealand comedy horror released in cinemas now. Except is isn’t. It is a Kiwi movie and it does combine those two genres but you’ll struggle to find it playing on a big screen. It had a couple of days of shows in a few cities following its July 3rd release but within less than a week it was gone. Now you can only watch it On Demand. The whole idea of on line viewing undoubtedly presents excellent opportunities for small independent movies to be seen but a few years ago, before films went out on multiple formats like this, something like Housebound would have certainly been pushed more in cinemas. It is a good film and with better marketing and distribution it could have had a higher profile. Production companies can presumably get their money back through internet purchases now so a lot of good movies are finding an audience but staying under the radar. I’m sure that if The Blair Witch Project were made now, rather than sixteen years ago, they wouldn’t have thought it needed the same publicity but as a result it probably wouldn’t have had the same huge success either. It is great that more people are getting a share of the market but I don’t think it’s a coincidence that no low budget film has made a decent dent in the box office since Gareth Edwards Monsters in 2010. What we need to do as film fans then is dig around for gold because there are lots of brilliant pictures out there that just aren’t getting seen. Returning to Housebound which is where this started, imagine a comedy in which Lisbeth Salander is charged with robbery and put under house arrest in the care of her old fashioned, fusspot, conservative mother. Oh, and the building is apparently haunted. That’s pretty much what you get with this film. It sounds like a broad parody but the tone is actually very carefully balanced and like the best comedy it is only a very slightly exaggerated version of real life. Comedy horror is a lot harder to get right than other genre mash ups but once again the events on the screen are pitched perfectly. The main character, Kylie Bucknall, is deliciously incredulous at everything that goes on around her, be it her mum’s penchant for banal gossip or the security officer’s methods for tracking the supernatural. She is our way into the action and has a quizzical look on her face for most of the film; more the girl with eyebrows askew than the girl with the dragon tattoo. The best examples of this type of film, Shaun of the Dead and Scream, managed to be both funny and scary and while Housebound is not quite as successful as these classics it is on occasion laugh out loud funny, really tense and a little gory. If you can handle those things together I definitely recommend it. Like Housebound, Coherence is another clever genre piece that barely saw the inside of a cinema. It is one of my favourite films of the year so far and shows that great ideas are far more important than big budgets when making Science Fiction. Only one of these things can survive without the other after all and what Coherence lacks in sets, effects and recognisable actors it more than makes up for with imagination. In fact studio versions of these high concept Twilight Zone types of stories, like Enemy, The Box, The Congress, The Zero Theorem and even Interstellar, often end up as confusing and a bit messy. Coherence keeps things tight and coherent. The basic set up involves a house full of people who discover that in another property down the street they are holding a very similar dinner party, identical in fact down to what they are eating and exactly who is eating it. It isn’t clear if these alternate versions of them are from another reality or a slightly different moment in time and it is fascinating to see everyone dealing with the incredible situation. Sound of my Voice, from last year, is comparable to Coherence in that it also explores the psychological impact of a sci-fi conceit without a flashy digital light show. 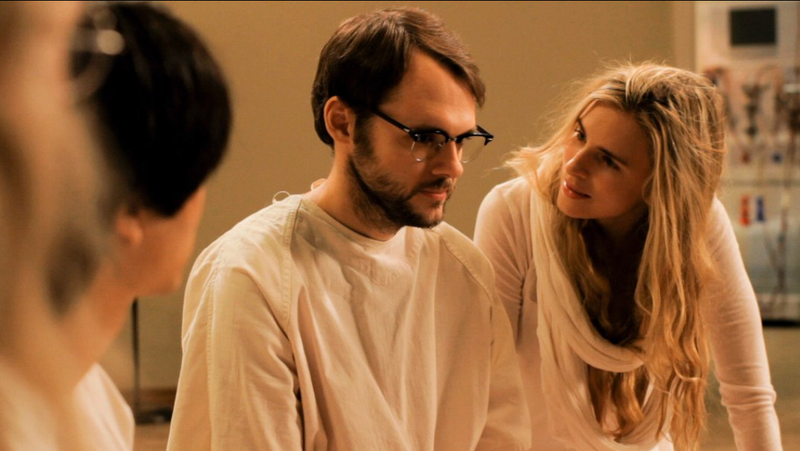 Writer/actor Brit Marling and writer/director Zal Batmanglij have since collaborated on a fairly standard thriller called The East but this is a far more subtle piece following two journalists as they attempt to infiltrate a cult centring around a woman who claims to be from the future. It explores how people can be seduced by bold ideas while seducing you with its own bold ideas, and all the while the question of whether this person has time travelled or not hangs over it in tantalising fashion. Martha Marcy May Marlene was released back in 2012 when Elizabeth Olsen’s greatest claim to fame was her famous sisters. This film was her calling card though and a successful career both inside and outside of the Marvel Universe is now assured. If she impresses you here then you should check out Liberal Arts too but this is the place to start. Olsen plays Martha (although there are those unsure of her name, hence the title) and the movievshows both her descent into and escape from a cult. It has similar themes to Sound of My Voice then but explores them from within rather than focussing on external perceptions. Olsen is superb in the film and her performance is the main reason to watch it but it is more than a character piece as you see how those around, in her real and replacement family, her all try to build her up while only succeeding to pull her apart. Talking of replacement families Short Term 12 is an excellent film about children in a care home. (Sorry if these segues are getting a little laboured.) Brie Larson plays Grace, one of the staff at the residence, who has been through the system herself. Her interactions with the kids are by turns funny, inspiring and moving and the film has smart things to say about being a child, being a parent and each’s perceptions of the other. It also subtly examines the portrayal of adolescence in cinema and the media if you chose to make those connections. I wasn’t sure if I was going to include the The Guest on this list as it actually had a fairly good cinema release last year. As it is though few people seem to have heard of it. I don’t want to say too much as it is best to let events with this one fold out in front of you. The narrative starts off with a family getting a visit from an ex-service man who had served with their late son and it is no great surprise that he turns out to be a little unhinged. It is what the film does with these conventions that is the real joy. Let’s just say it isn’t quite the movie it appears to be at the start. The next nugget to throw your way is Trash. I still can’t believe this film made such little impact on its cinema release earlier this year it has so much going for it. Most central to it’s appeal are the excellent performances from the three unknown child actors at it’s centre. Brazilian street teens, Raphael, Gardo and Rat, get hold of a lost wallet containing cryptic information that could bring down a corrupt Rio politician. Chased by dirty cops the boys have to figure out what the evidence they have means and where it could lead. Trash is a mystery crime thriller and is gripping, funny, exciting, gritty and totally charming. Slumdog Millionaire meets The Goonies. Trash is also almost entirely in a foreign language and this is another reason why movies don’t get wide distribution. The remaining films on the list are all from other countries and while some have enjoyed great success on the art house circuit none have had anything approaching the wide appreciation they deserve. I have to mention Ida. Anyone who has spent time with me over the last ten months has heard me rave about this masterpiece from Polish born British director Pawel Pawlikowski. It is a black and white film about a nun taking a brief journey of discovery in the 1960s before taking her vows. This isn’t the swinging decade though, it is a time where people are still damaged by the war and lies and quilt are not buried deep enough. Lead actress Agata Trzebuchowska had not acted before and was spotted in a Warsaw cafe by one of Pawlikowski’s friends and persuaded to audition. Her performance is understated but strong and you can see that while she is innocent she is not naive. Depending on your religious sensibilities you will be yearning for her to either run to or from the closeted nunnery by the end and the closing scene satisfies no matter which you are wishing for. Ida won the award for best foreign language picture at both the Oscars and the BAFTAs this year but I bet you still can’t find three people at your work who have heard of it. As long as America has the monopoly on blockbusters European films continue to tell smaller more realistic stories. French movie The Past is a perfect example of this as separated couple Marie and Ahmed meet up to finalise their divorce. There is no exposition at all and you discover what is going on just as the characters do. Like the films of the Dardenne brothers the premise sounds a little dull but like the films of the Dardenne brothers it is totally compelling to see the characters personal secrets come to the fore. If you check out this one and you like it I suggest you search out Force Majeure too. Clouds of Sils Maria, also from France has a little more to it on paper. Juliette Binoche plays an ageing actress and Kristin Stewart her assistant in this examination of femininity and age. I am sure I’d have taken something different from this film when I was in my twenties but I’m sure it would have been no less profound. Like The Past and Ida it is built on a great script which is something missing from so many films currently doing the rounds in cinemas. There is something a little sad about how little attention is given to the dialogue in things like Jurassic World but when that kind of stuff can earn such huge amounts of money no wonder they don’t bother. Talking of Jurassic World I would strongly urge you to search out another film from Irrfan Kahn who appears as millionaire Mr. Masrani in that film. The Lunchbox tells a simple tale of two strangers who communicate with one another via notes sent back and forth in lunch boxes when the Mumbai delivery service starts sending the food a young housewife is preparing for her husband to a man soon to retire. Clearly having never met the couple are not aware of their age difference and they are able to bond with no expectation, presumption or judgement. It’s a far more charming and more casually paced version of a web chat and ultimately more bittersweet. So there you go, it’s not all car chases, superheroes and dystopian futures. You’ve just look a little harder for the other stuff.